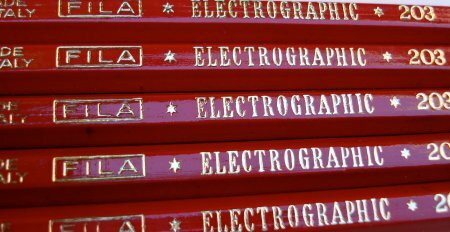 The Fila Electrographic 203 is an exceptional pencil. Made by Fila in Firenze (Florence), Italy, the pencil has an unrounded hexagonal shape and an outstanding fire engine red finish. The lead is like that of the cousin IBM Electrographic – leaving an extremely dense, rich, saturated black line. The lead is of such high quality that it makes most competitors seem lacking. I’ve been comparing it with top modern pencils such as the Pentel Black Polymer 999, and subjective observation suggests it is at least as good at most tasks. Combined with the outstanding finish, the pencil is a true standout! is this a vintage pencil or it is still in production? Oh, please do tell where we might buy this beautiful pencil! Unfortunately, I don’t have any definitive information, but the style of the unrounded edges and lack of a modern bar code suggest it is a vintage pencil. 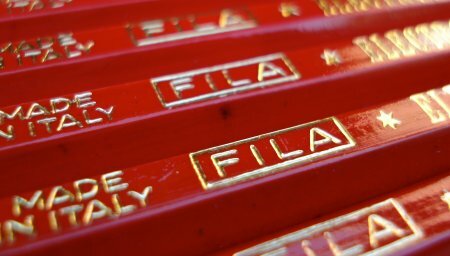 Neither FILA’s own website nor brandnamepencils.com (a good source of pictures of vintage pencils) reveals anything about this pencil. My guess is, that it indeed is vintage, probably from the 60ies ? Back then, this kind of lead was needed for photocopying and machine reading – just like the mark sense leads BTW. Pity it isn’t available – it sounds like my kind of pencil.